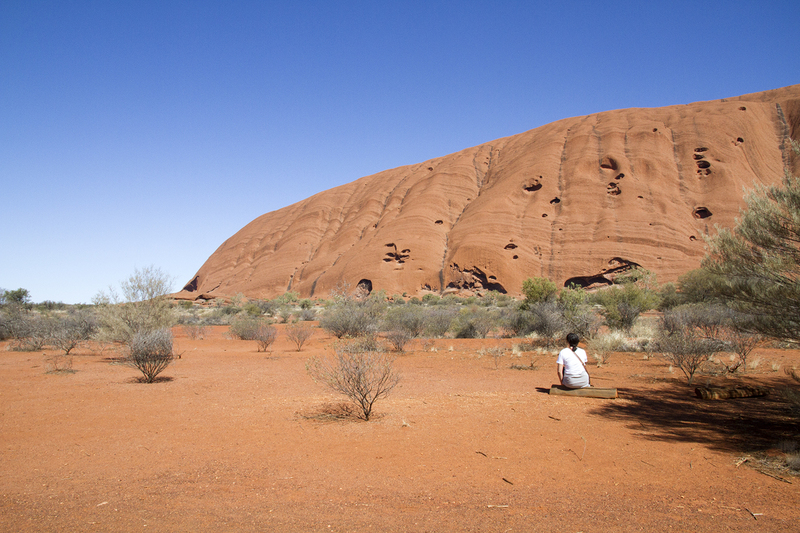 It really boggles my mind that people travel all the way out to the red centre of Australia in order to climb Uluru. Not only is it incredibly offensive to the Indigenous population of Australia and incredibly dangerous… it’s a waste of time. 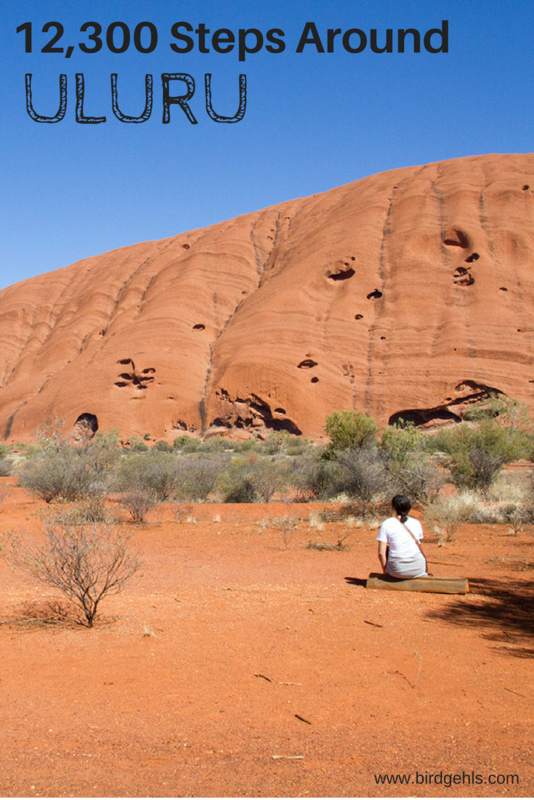 There are so many other ways to experience Uluru, without putting yourself in danger or upsetting other people. The best way to do this is to walk around the rock. 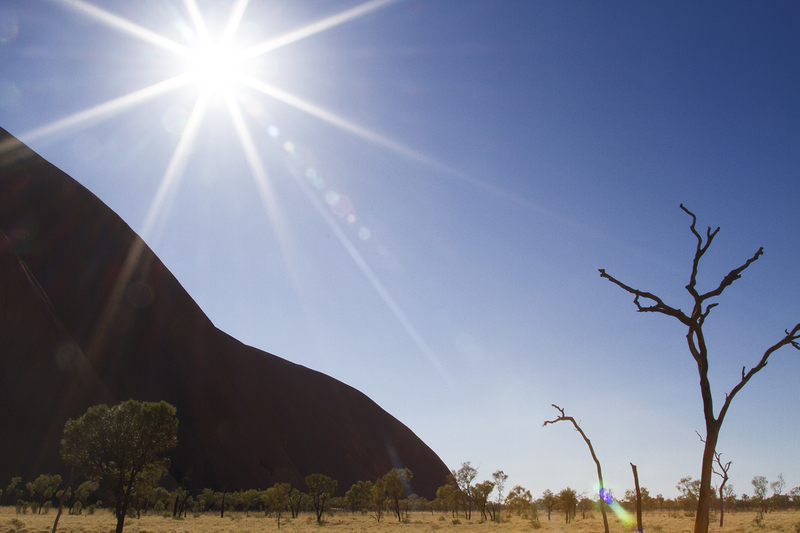 Australia’s famous icon is 600 million years old. It sits out in the middle of nowhere – the nearest town, Alice Springs is 463 kilometres away (that’s a five hour drive by car). 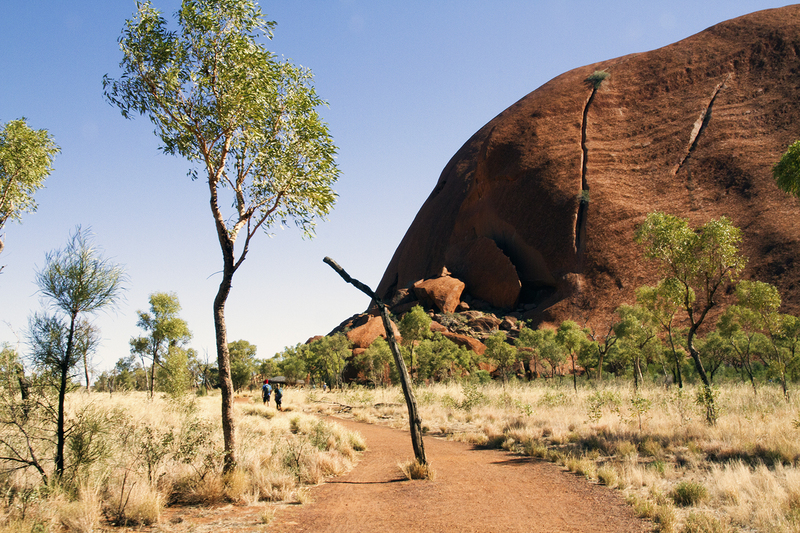 Uluru is 3.6 kilometres long and 1.9 kms wide. A good chunk of it extends deep into the earth; no one is exactly sure of how far down. 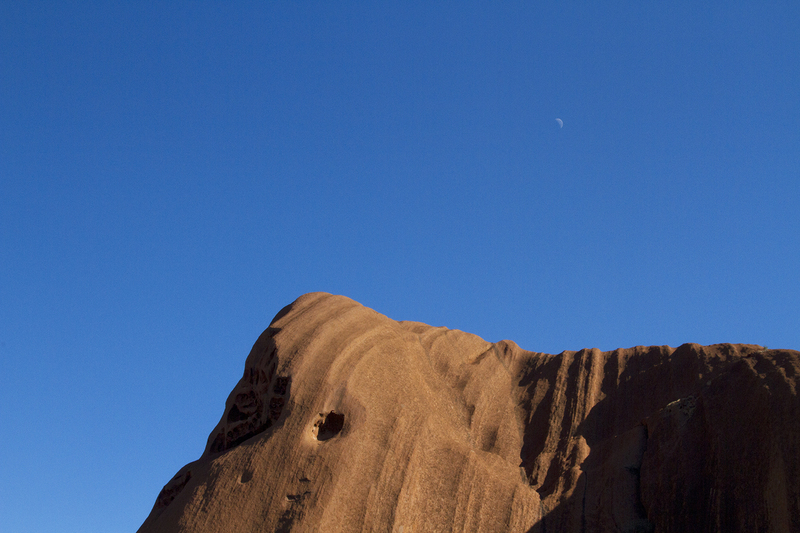 It and nearby Kata Tjuta are a marvel. Giants, ancient rocks in the centre of Australia. You don’t get the scope for just how big Uluru is, until you take a good 3.5 hours or so out of your day to walk around it. 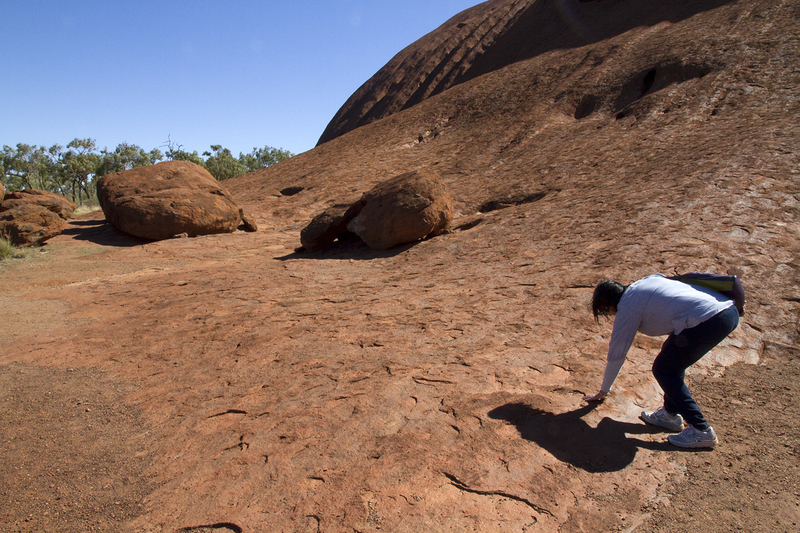 To circumnavigate the rock, one would have to take approximately 12,300 steps around Uluru. So, that’s what we did. We walked every single one, almost a year ago to the day. 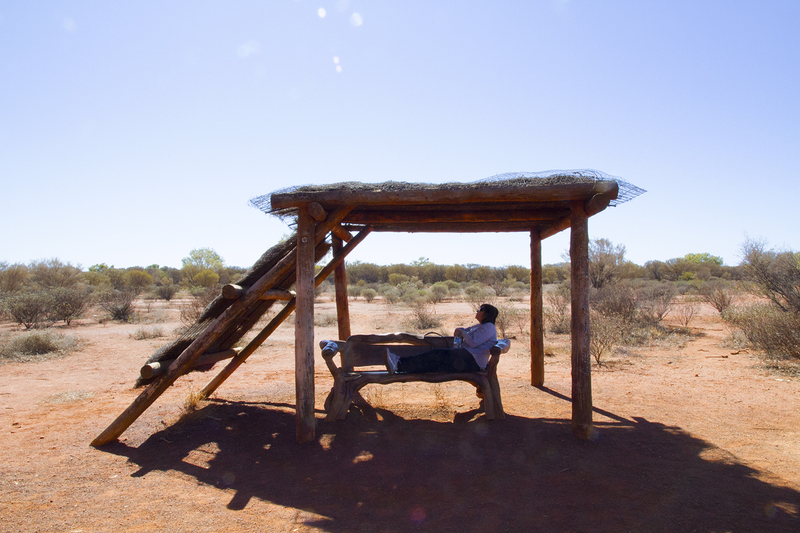 It was my mother’s 60th birthday and we’d flown into the outback from Sydney, in order to give ourselves four action-packed days in Yulara – the small town situated near Kata Tjuta National Park, where all visitors to the area are required to stay. We chose the Desert Gardens Hotel and it was perfect. A decently sized room with a view of the rock out our window – what more could you ask for? There are a range of options available, suitable for any budget. Camping grounds, a hostel, self-contained apartments and a slightly more upmarket hotel, to the one in which we stayed in. If you’re super flush with cash, you can book at Longitude 131°, Ayer’s Rock Resorts “luxury retreat”. 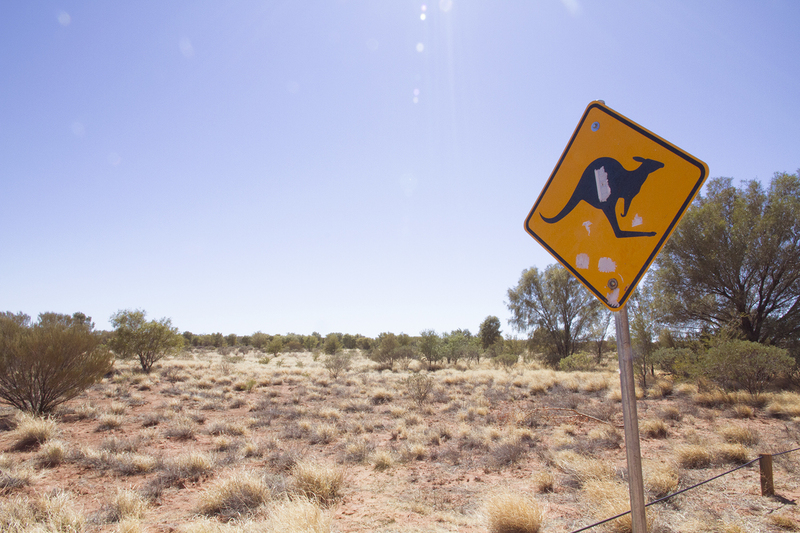 It’s described as being “Australia’s most exclusive outback encounter”. I think what they meant to write was “Australia’s most expensive outback encounter.” It’s only a mere $2,700 AUD a night. I heard when Nicole Kidman stayed there, she rented out the entire lot of them, for her and her guests. The problem with visiting what is essentially a resort in the middle of nowhere, is that you will be subject to their prices. And while I don’t mind paying a little extra for a once-in-a-lifetime experience, costs around here can get downright ridiculous. If you have a car, you can drive out to Kata Tjuta National Park. It takes around 35 mins to get to Uluru and another ten minutes to Kata Tjuta (also known as the Olgas, in case I’ve been severely confusing you so far in this blog post). Entry to the park is $25 per adult and $12.50 for children. The passes are valid for three consecutive days. Sans car? Well, there is a shuttle that operates back and forth from Yulara to the park. From recollection, it was $60 for each of us (my mother and myself) for a round trip. I told you travel in Australia is expensive. If you’ve opted out of climbing the rock (good on you!) 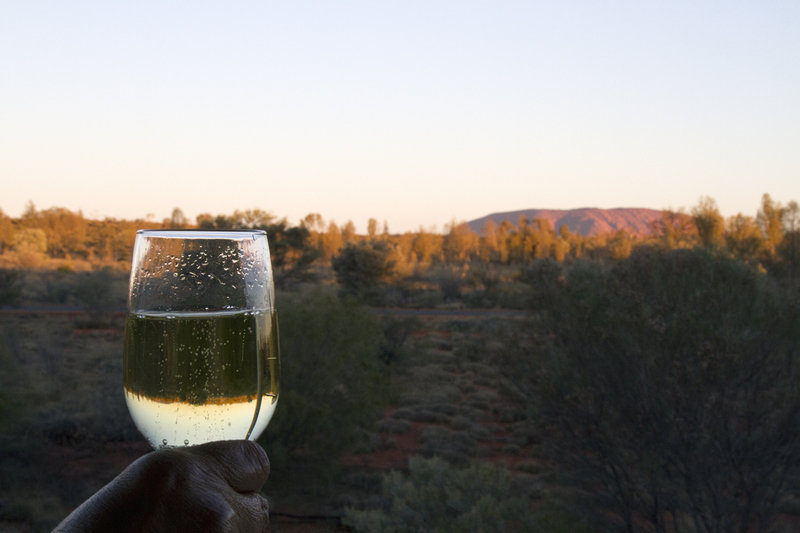 you have two choices for getting around Uluru. You can ride a bike. They’re available to rent onsite. 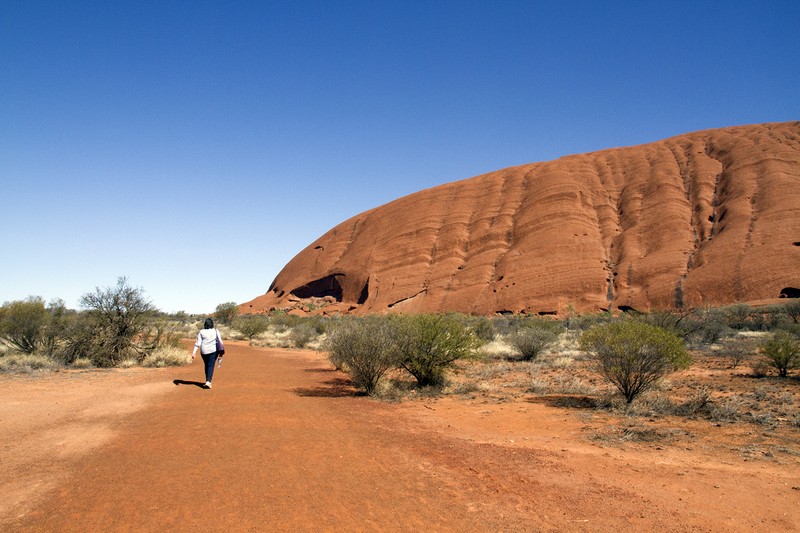 Or, if you have a good chunk of your day set aside, you can walk the 12,300-odd steps around Uluru. Mum and I both agreed that we couldn’t imagine a better way to spend her 60th birthday. The walk is long, taking anywhere between 3-4 hours to complete. You could probably get in done in three, if you didn’t dawdle. Yet, that would certainly be a waste of your time in itself. There’s no point in walking around Uluru if you don’t take your time – marvelling at the formations of the rock, reading up about the Indigenous stories involved with certain parts of the structure. Having a gasbag with people you meet along the way. Putting your feet up for a spell and taking in the surroundings. These chairs are way cool. The base walk is littered with them. A tour guide told us they were built out of the remnants of the devastation left in the wake of Cyclone Tracy, which razored Darwin over Christmas in 1974. Apparently one bloke gathered a bunch of wood shortly after the cyclone hit and has been making chairs out of it every since. Can’t verify whether or not that’s true, as could find zero information about it on the Internet. Would be neat if it were, that’s for sure. Either way, they were pretty handy and well utilised by many who were doing the base walk. 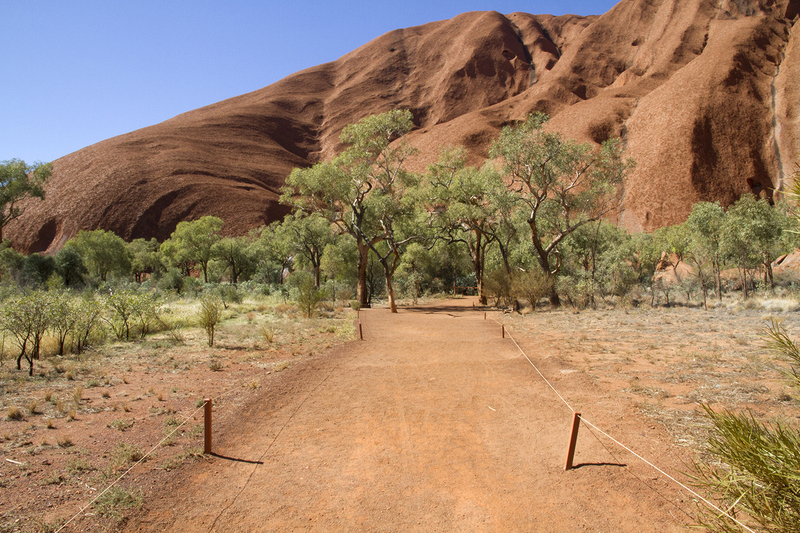 As you walk around Uluru, you’ll spot signs asking that you refrain from taking photographs of certain sections. This is because the rock is still considered to be sacred for the indigenous people. Women and men have their own territory on site, some of which cannot be seen by tribe members until they’ve been properly initiated. If you see one of these signs, please heed its request. I saw some people taking photos, while standing right next to the signs that were specifically telling them not to do so. The blatant disrespect shown by some is alarming. There is still plenty of the rock that visitors are free to photograph. You won’t be bereft. Trust me. You should have seen me trying to narrow down the photos I wanted to put in this post! We did the walk in the middle of winter. Conditions, as you can see from the photos, were perfect. It was a balmy 23 degrees on the day. Mum and I both wore light jumpers to start with and stripped down to t-shirts about a kilometre in. We were comfortable in trousers and wore basic running shoes. I’d advise you to wear sunscreen, no matter what the time of the year, as the Australian sun is notoriously vicious. Bring a water bottle as well, and snacks if you fancy it. Remember to leave nothing behind – keep Australia beautiful! From what we saw, the path is quietest around the middle of the day – I imagine the place gets pretty packed out around sunset. We passed (or were passed) by the odd couple, but spent long stretches of the walk on our lonesome. Suited us fine. Unlike the climb, the walk is not taxing. I’m not the fittest person in the world, yet I didn’t struggle with it at all. It’s flat the whole way round and if you’re taking plenty of breaks, you’ll find it to be no trouble. The feeling I experienced when I completed the base walk was extreme satisfaction. I really, truly felt I’d achieved something. 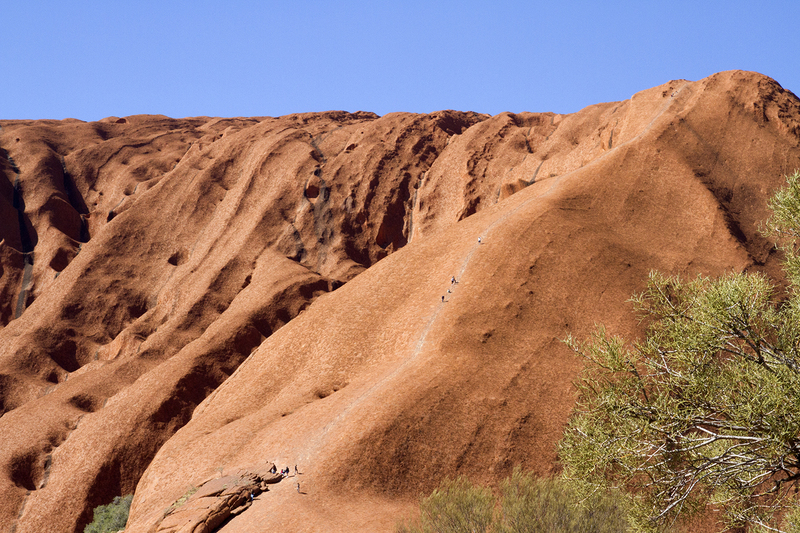 I don’t think I would have felt quite the same way if I’d merely climbed Uluru, but I guess that’s pure speculation. For which I am not sorry! At the completion of the walk, you can “stroll” a further 2 kilometres (if you’re up to it) to the nearby Cultural Centre. 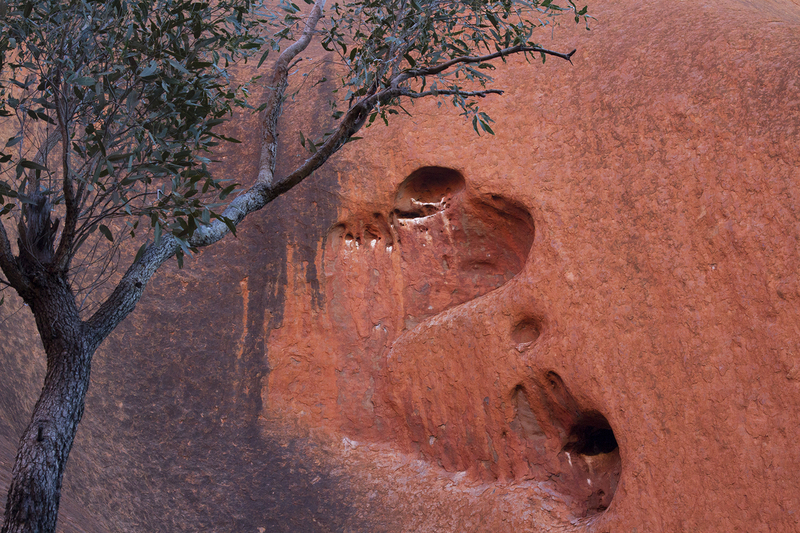 Here you’ll find further information about the Anangu people who have called the area home for centuries. There’s also basic food and drinks and plenty of seating. I recommend ice cream as a reward. After that epic walk, Mum and I felt we deserved a treat. So, we went and stuffed ourselves full at Tali Wiru that night. We both agreed that it was the perfect end, to the perfect birthday. 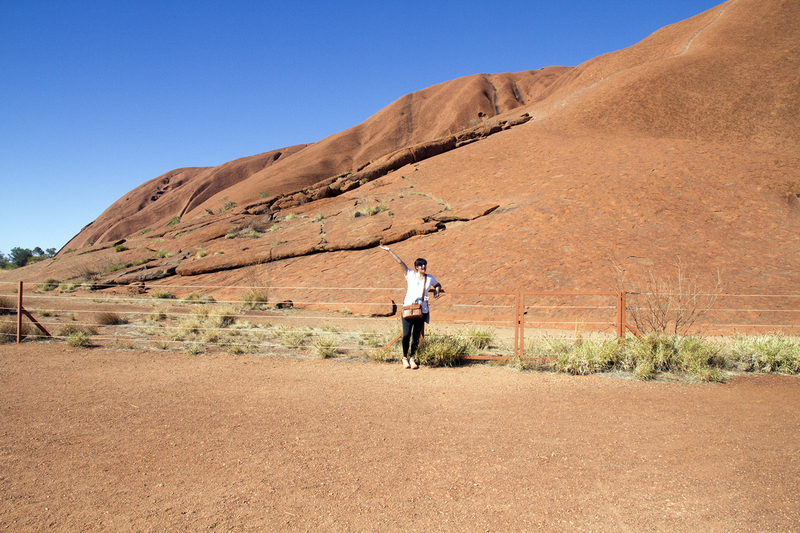 Have you done the Uluru Base Walk? Would you like to? A great review of the Rock and area. We first visited early 1970, no restrictions and cannot remember seeing any Aborigines in the area at that time. Visited many of the caves around the Rock on Ranger led trips, one we have photos of have now been told there is no such cave. One of the best things of that era was that you camped with the most wonderful view of the Rock, wake up in the morning and see it from your tent. Magnificent. In those days there was no restriction on climbing or even a request not to, that has only happened I believe when land claims became a political issue. As for climbing, I have climbed it 8 times, first with my Father, then my Sons and now with my Grandchildren, it is one of the most spiritual things all of us have ever done. Anyway, glad you enjoyed it.keep on travelling. Not sure when it finishes but do your self a favour and see it. When in Alice the MacDonald ranges caravan park is one of the best we have ever stayed in. No affiliation. Enjoy the centre, it is a wonderfull area. Thanks for your comments Rob, glad you’ve had such special repeated trips out to the rock. Walking around it was a pretty unreal moment for sure.